Our biggest collection of puzzles is back, putting a spring in your step and a challenge on your page. 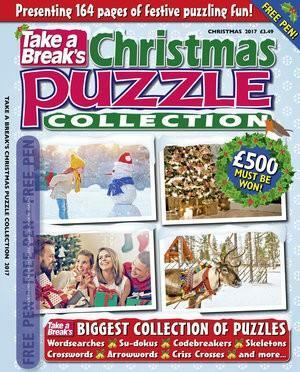 Take a Break's Seasonal Puzzle Collection includes your favourite puzzles from our extensive range of puzzle magazines and puts them together in one fun-packed 164-page book.Su-dokus, crosswords, wordsearches, criss crosses, codebreakers and arrowwords are all here in abundance, so if you like variety this is the magazine for you. £500 could be yours for solving a crossword too! Take A Break&apos;s Seasonal Puzzle Collection is very challenging and interesting. Worth getting it if you have lots of time on your hands and don&apos;t mind a bit of brain workout. This is published 9 times per year, please allow up to 6-8 weeks for your first delivery. Your subscription will begin with the next available issue.